Two guest operators switch at Peters during one of the week's operating sessions. Last week, the National Model Railroad Association held its annual convention in Kansas City and was attended by almost 1500 model railroaders. 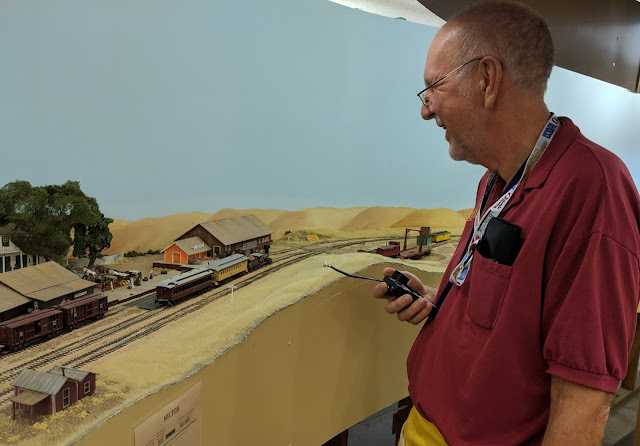 During the week, these brave folks were treated to clinics, layout tours, operating sessions, non-railroad tours and some just plain fun. The Copperopolis passenger local briefly stops at Milton en route to Peters. Since the Kansas City area is home to the Stockton & Copperopolis, we had to participate in the excitement as well. We had two bus tours with about 140 people viewing the railroad. I gave two clinics twice each. One was on improving the performance of small steam engines and the other was on modeling the nineteenth century using the modern techniques we have available. Both were well attended. A private car is dropped off on the house track at Farmington by No. 4. 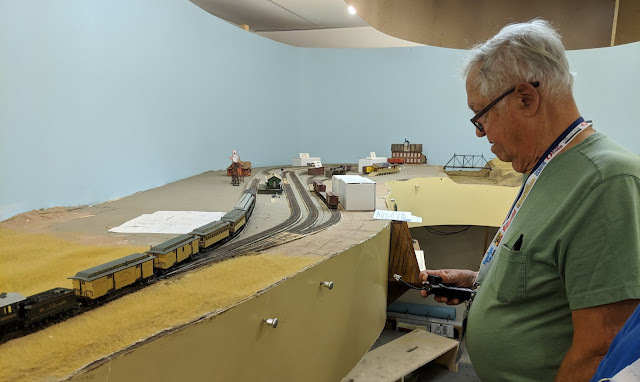 The railroad was also open for two operating sessions during the week and for a special visit by members of the Layout Design Special Interest Group. Capping off the week was the National Train Show where one could visit and speak with many of the hobby's manufacturers. It was a hectic time for me but well worth it. Now it's time to get back to normal and continue building things.